Construction of the new China Science and Technology Museum will be completed by May 30, in time for a glitzy debut featuring precious cultural relics. More than 300 relics under first-grade state protection, from museums all over the country, will be showcased at the opening exhibition, which is set for July 15, the Beijing Daily reported on Friday. "It's a rare chance for so many relics to be showcased in a single exhibition," the newspaper quoted curator Xu Yanhao as saying. 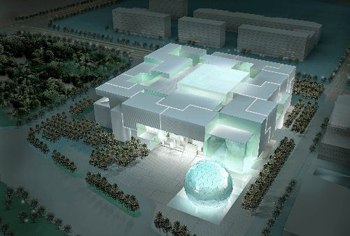 Covering 4.8 hectares, the museum combines ancient Chinese scientific thinking and modern technology in its design. The building blocks are arranged to resemble a huge traditional Chinese lock. "Construction started in May 2006 and is nearing the end. We are working on waterproofing, ventilation and anti-freeze projects," Xin Bing, deputy curator, was quoted as saying. The museum is located to the north of China National Stadium, the main venue for the Beijing Olympic Games known as Bird's Nest. It is part of the facilities to serve the Games. The museum, which boasts the world's largest dome screen video, is expected to officially open to the public in September, 2009. 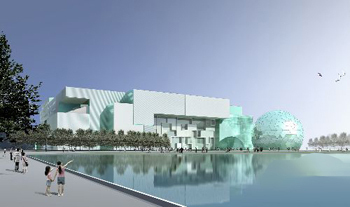 It will become a top-notch public facility for exhibitions, scientific research and other functions. The existing structure that houses the China Science and Technology Museum was built in 1988 and expanded in 2000.